So before the onslaught of new games next month to which I am heartily looking forward to getting, I though it might be fun for each of us to do a retro-review. I thought we could focus on an older game, still worth playing and preferable (but not required) obtainable that could be thought of as a forerunner to more recent games and up coming games. This is the GCL: Eclipse Division discussion list for the week of Sept 22, 2013. Please visit the GCL: Eclipse Wiki for information on this Game Chat League. Thank you for respecting these guidelines in our home of regular discussion. We hope the conversation created here is rich, informative, and most of all, fun for members and nonmembers alike. So as I mentioned last week, I pulled this little gem off the shelf at a friend's request. You all know how I like the physically small games (you can have so many more games). Well, Meuterer like many of the newer Japanese games is a deck of cards. The cards form the board. There are 12 cards which for a circle of islands each of which allows sale of a specific type of good. 2 of the islands allow sale of any type. A captain is chosen, randomly at the start. The captain determines if the first mate will be paid 0-3 VP to assist if there is a mutiny. Each player starts with a hand of 5 goods/conflict cards from a small deck. Starting with the Captain each player chooses to play a good/conflict card or pass. If the Captain passes, the cards left in hand determine the distance sailed to the new island. Islands visited the current turn and the past turn are the only ones where goods can be sold. If the captain successfully travels to the next island, VP are also awarded. If another player passes they are allowed to choose an action card or role. Mutineer was one of the first games I played, with roles that have special actions mechanism and predates another classic, Puerto Rico, known for this by 2 years. Meuterer and Verrater were also some of the first with a hidden traitor mechanism. First Mate who receives payment in VP from the Captain. Loadmaster who receives 3 extra goods cards to choose from at the end of the turn. Trader who breaks ties when goods are sold. Mutineer who challenges the Captain for control of the ship and if successful becomes Captain for the next turn. Ship's boy who assists the Mutineer and will earn 2 VP. After every player has passed roles are revealed and if the Mutineer has been chosen the Captain, Mate, Mutineer and Ship's buy may play additional conflict cards from their hand. If there is a tie or the Mutineer's side has more conflict cards the Mutineer becomes Captain and the ship travels the distance equal to the cards left in their hand. Goods are then sold, The person who has played the most of that good gets VP, if 2 way tie both are awarded lesser VP etc. If a player has the Trader and ties they get the max VP and the other tied person gets the lesser VP. After 8 or 9 rounds most VP wins. The game also included a Pirate variant way before the pirate craze of a few years ago. Medieval Merchant is, not unsurprisingly, an economic game. The original German title is Pfeffersäcke (Pepper Sack) referencing the spice trade in medieval Europe. This game was released by Goldsieber Spiele and Rio Grande Games in 1998. It is a big box game, with a rather intense looking board. There are significant differences in the play of these games. In Medieval Merchant, your goal is to accumulate the most prestige. You do this in a few ways, but the biggest method is to out-position competitors in cities. Each city has a disc indicating the city has been opened for trade. Players spend their initial turns gradually opening up the board, by placing a city disc to the board. There is a fair bit of strategy in this. Generally you want to open a city you can use, hopefully before some competitor gets there first. But it is almost certain that you will be forced to open up cities you will never be able to serve. So the timing of when to open which city is interesting. Coupled with the decisions just mentioned, you must initially start your incipient merchant empire in a lowly village. Villages do provide a single victory point, but their chief utility is to provide inexpensive routes to cities. If you look at the picture provided you will see a big difference in the cost of routes. Each turn most players will want to expand their board position by opening a new branch. This can be compared to expanding your service to another city in Power Grid. Both games force you to pay connecting fees to get to the next city. In Medieval Merchant you can do it fast and expensive by going from city to city, or take two turns and route through a village to save a significant amount of money. In Power Grid you must buy fuel to serve your network. In Medieval Merchant you are free of that expense. However, you must decide city by city, whether you wish to make money or not. You might think that is a simple decision, but it is often not. Each city disc has a number of open slots. The payout varies depending on the number of players, but basically the best situation is being alone in a city. You will be paid for each empty slot in a city where you have placed a house. Sadly, the other players will quickly follow you to most anywhere you go. There are more details, but I should wind this down. Medieval Merchant offers a connection game coupled with an economic battle. Instead of players competing for the power plants and fuel as featured in Power Grid, players compete for position and control on the board. Both games have earned long term shelf space in my collection. I think Power Grid scratches the same itch that Medieval Merchant does. I don’t say that Power Grid necessarily directly benefitted from the design of MM. But I do think that Power Grid took the same basic idea and made it a bit easier to understand, and easier to explain. Nevertheless, I feel MM is still a very worthwhile game, and heartily recommend you give it a try! But - perhaps Mü will do. This is the game I've played third most, since I started keeping track. It's a distant third - I've played Race for the Galaxy, the game I've played second most - a thousand more times. But - I've played the game 10 or more times 9 of the past 10 years; Bridge is the only other game to manage this. 95% of my plays of Mü have come at "cookie time" - a Friday afternoon tradition at work, where different folks bring cookies each week. The game is a simple one at heart - it's a trick taking game. There are three primary elements that make the game stand out. First, there are two trumps, either of which can be a color/suit _or_ a number; the second highest bidder chooses the lower trump, then the high bidder chooses the higher trump. Both the presence of a second trump and the ability to choose numbers as trump help to make for a _very_ interesting game. There's more variability than in, say, Bridge, but that helps to make Mü stand out. The second element of the game which stands out is that tricks aren't counted - triangles are. Each card has 0, 1, or 2 triangles; it's the triangles you take in the tricks that take that matter. Everyone scores for the triangles they take. The high bidder and partner score a bonus for taking as many triangles collectively as bid; the other player score a bonus for preventing that. Variable partnerships are the third rule that makes Mü stand out. After bidding is complete, the high bidder chooses their partner - anyone other than the second highest bidder. This, in turn, is the reason Mü should only be played with 5. With 6, it's a 4-2 split, which works - but really isn't ideal; neither is the smaller number of tricks (just 10). With 4, it's a 2-2 split - and why not play Bridge? The original Doris & Frank edition came with rules for 3, but they should be ignored. And thus - if you enjoy trick taking games, there is no game I can recommend more strongly for five players than Mü. When playing at cookie time, we just don't bother if we don't have five players - and never think about adding in a sixth when one shows up. When we had a very good Bridge player at work who enjoyed Mü, he wanted to reduce the variability some, and thus created Token Mü. If the lack of information available, and the swings it causes, bother you, I'd recommend it as an alternative once folks are familiar with the game. It's likely not necessary for most. I can elaborate in words if you wish. Like others, I am having a hard time with this one. Lorna, you are making me think too much. How about the ancestor of so many games Acquire. To me it meets every definition of a classic. I still have and still play using my 3M bookcase copy purchased during the 1960s. It was one of my first games, and one that I could get my family to play. I guess I've gotten my money's worth out of this one. I see echos of the company growth base on board placement, merger payouts in many decedents. Some that I can remember off the top of my head are Airlines Europe/Union Pacific, Rheinländer, Stephenson's Rocket and I'm sure there is more. Having your selection of tiles drives what companies you want to start and which ones to grow. The combination of tile growth and corporate mergers will make companies more valuable, but you don't want to happen too fast because you want to purchase the companies stock before becomes valuable. If you are first or second in a companies stock, mergers are your friend since the bonuses and stock sell backs gives you money to keep acquiring stock. Like real life being out of money is a bad thing. It also give you the opportunity to swap low value stock for higher value stock. So it may be in your best interest to force a merger. I can even enjoy the original theme of hotels - I remember reading about Conrad Hilton and Willard Marriot. So, before Dominion, or Mage Knight, or Trains, there was Starcraft. The primary mechanism in SC is deck building. You generate resources through area control and then spend some of them on upgrade cards which are added to your deck. Combat is handled through the multiple-function cards within your deck in concert with building the units that the upgrade cards in your deck supports. Oddly enough if I wanted to play a shorter version of SC I'd reach for Nexus Ops all day long, but there are a ton of customization and tech tree options that you lose as a result. I think very few people realize just how far ahead of the curve Corey was. I always say how thankful I am that deck builders are evolving and including board elements, but there's been one out there all along. Our last list was about expansions, and this was one that I overlooked. SC does everything an expansion should do: give you more of what was good while staying out of the way of what the design did right in the first place. The game is almost completely unavailable unless you want to pay big money, and will likely never see print again as FF seems to have abandoned the Blizzard partnership forever. It's our loss, but the legacy lives on. Depicted is the version I originally owned. No, I haven't played this one recently. Do you remember the days when Knizia had an "Auction Trilogy" and then it turned out his auction titles were more than 3 games? After a while I lost count. But I always thought Medici was the best of them, as well as the purest auction exercise. These days, the lot-setting mechanic with an auction would be a smaller element in a larger Euro game. You might even find a theme attached. - You can track information, but its not perfectly known. Because of the tiles thrown out, you can't know for certain what is going to show up at the end of the round. You're forced to make some gambles. - TIMING. Do I take an early lot? Do I risk getting screwed out of getting anything? (It can happen)? What size do I make the lot? - There is short term scoring and long term scoring ("long" being a relative turn in this quick-playing mind-bender). - This game was probably one of the first times I realized how well an auction self-balanced in a game. I also remember experiencing that in the auction variant of Tikal. But the point was that good players would be rewarded by more correctly valuating a speculative bid for a lot. I found that principle very attractive...even though bidding was also a form of stress. I have to commit. How do I know how much this is worth? - There were levers to try and screw with other players. Once you see what they're bidding up for later game bonuses, you can put together your lot in ways that mess with them. Anyway, I should probably try to get this played again soon. Unfortunately, as games have evolved a bit I think a pure auction game is harder to get on the table. September is usually a slow month for me - and this year is no exception. Construction Zone is OK, buy bland. R-Eco Recycle is a bland follow-up to a good game. The Union Forever! doesn't seem to work. Der weiße Lotus is - awful. Well, not awful for everyone, I suppose. But I like to have more ability to hold state than this game offers. Capek is Nodwick: The Card Game, with events but without all of the interesting bits. Double Crossing was the best of the lot. There's not quite enough game there to want to play again, but it was pleasant enough to play once. Indus - I think this is one I like more than anyone else. It's not a deep game, but it's a pleasant one, that has some of the feel of Backgammon to me. Amun-Re - my tendency in the game is to build no pyramids in the first kingdom. But I drew a bunch of 2 stones -> pyramid cards early, so I built bunches. It was great to get this back to the table again. Tyranno Ex - great fun, as always. Filthy Rich - unfortunately, our three player game was a 2-way battle, but it was still fun - and the game hit 10 plays for me. How old Cary Grant? Old Cary Grant fine. How you? BattleTech with the Once and Future Gamers. Advanced Squad Leader The annual FRASL Fog of War tournament. I didn't do too badly, but I didn't win either, but it is ASL, so who cares, I am playing ASL which, of late, I have not been able to do as much as I would like. In a way it's a light week this week. We spent quite a bit of time planning, playing, then discussion X-Wing since we're trying out a ton of new builds after wave 3; so that's been our biggest, yet still wonderful, time sink. It's great when the discussion eclipses the play. 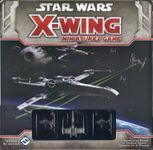 Star Wars: X-Wing Miniatures Game x3 - Several 3p sessions. They take a couple of hours each, especially given how competitive they've been, but SO good. Wave 3 is the best thing to ever happen to this game. Love Letter x5 - I like this FAR more than I ever expected to. After each game I saw places where I could have made better decisions. I was extremely gratified that the decisions I made had more weight on the outcome of the game than luck of the draw did. 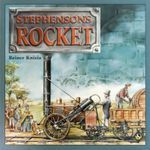 Stephenson's Rocket - This is a game I played back when it was new. But I never owned it, and had largely forgotten how to play it. Earlier this year I did a massive auction for a friend, and retained this from the auction, as I decided I wanted to revisit it. I am glad I did. I've played it twice this month. The first playing was rather tentative on my part, as I needed to experience the game anew to get reacquainted. But with my more recent 2nd play, I began to appreciate how this game allows you to try all sorts of different ideas out. Now, I will say that we had one player who was at sea with the game. He made moves that were not in his interests. So I definitely see this as a game where you need players of roughly equal skill levels. Medina - This has been a bit of a hit around here. I have been playing it with different groups, and have had a good - excellent response from everyone I have played with. Medina was a game I didn't respond to very well back when it was new. But my tastes have changed, and I quite like it now. Nur Peanuts - Another older game. I reacquired this one on a whim. We had an excellent session with this. I decribe this game as a cross between Can't Stop and Monopoly. It is a game where you either want to be the first to acquire 6 properties, or be the person with the most cash (property value does not count) if someone goes bankrupt. Our game came down to a round where 2 of the 4 players had a chance to win by winning the round and being able to buy their 6th property, or that I might win by winning the round and having the 4th player be unable to pay me the fine. It was a wild ride, with lots of displacements and agonizing choices. I won, but even the player who went bankrupt loved the game. Siesta - This has been a favorite closer for my Monday night group for years. I often do well. But this playing had me a beat behind the whole time. Still a favorite. We've been saying that Medina is an advanced Siesta game. Not really true, but I get at what is being expressed. Both games are very abstract in their play. City of Iron - My first play of this newer game. Turns out I waited just long enough for all of the rules to get ironed out. I enjoyed this game. I didn't see anything all that new in the game. But maybe the custom deck building element is a gentle twist for the rest of the mechanics. I somehow won, which I think surprised everyone, including myself. Crokinole - Always a fun game. But we were crushed 10-0 this time. ... and thanks for all the fish. I considered Kremlin (1988), but a number of people in our GCL have already played it and it has a new edition coming out. Wiz War (1983), too, but it has a new (though FFG-changed) edition and I’m not sure how well it would comport with what most in our GCL want with a game. So I’m torn among Rommel in the Desert (1984), Skat (1810), and Sticheln (1993). RitD is a wargame, which is an autoturnoff for many; and Skat is just ridiculous. So I guess it’s Sticheln, which only Lorna and Kevin have commented on. I like trick-taking games as a rule, and I’ve amassed a small collection that explores the different outcroppings of the family: setting (Rook, Mü), exact bidding (Up and Down the River, 99, The Seven Seals), card passing (The Bottle Imp), trick dividing (David and Goliath), open bidding (Mü), silent partnering (Schafkopf), nesting (Rook), stockpiling (Skat), pledging (Triumvirate), contracting (Skat, Schafkopf), poisoning (The Bottle Imp), set collecting (Bargain Hunter), player powers (Cosmic Eidex), and themed (Pacific Typhoon). As you can see, some of these nodes of the trick-taking web are occupied by just a couple games. But Sticheln is unique among the trick-takers I play by being more like a minefield than any other board or card game I have played. A Sticheln deck is numbered from 0 up to anywhere from 8 to 18 (depending on the player count). It includes either five (3–5-player) or six (4–8-player) colors. Simultaneously, each player reveals a card face-up on the table as the beginning of his penalty pile. Every card he takes of that color, including the card he just revealed, will count its value in negative points toward his final score. All other cards he takes will count 1 positive point toward his final score. The trick lead opens the trick by playing any card of his choice. The color played (unless he led a zero) is now the weak suit. All other colors are considered the strong suit. Zeroes are always considered to be the weakest cards of the weak suit, but do not themselves determine that suit. Players need never follow suit. Whoever plays the first highest-valued strong card takes the trick. If no strong cards are played, whoever played the highest-valued weak card takes the trick. If only zeroes are played, the first player takes the trick. It would be easy to dismiss Sticheln, rules unread, as another ‘trick-taking game with a twist’. But the ‘twist’ upends the entire genre. Suit need never be followed. Depending on the number of players, 71–79% of cards are trump. And it’s difficult. Everyone’s temptation in our first game was to try to pass off penalty cards on each other, but we gave that up after our first game ended with the winner in negative points. Just trying to avoid taking cards in one’s own penalty suit is quick a tall enough order for beginning players at least. • How high a card can I pass off as my opening penalty card? Too high and I’ve taken negative points I might have lost, but if I think I’ll take them anyway, better to get it out of the way and avoid a trick later. • When should I play my zero(es)? A zero will give a player an automatic escape from a dangerous, perhaps catastrophic trick, but there might be worse tricks yet to come. Taking the seven and eight of one’s penalty suit on the last hand is a punch in the gut. • Who has the zeroes? If you’ve been counting cards (to make it easier on everyone, we spread all our taken tricks out in plain view, to ease card-counting; it speeds up the game considerably, and Gary Garison would approve), then as soon as you know one player doesn’t have a zero, with reference to your hand and the table, you can start playing his penalty suit with impunity, forcing him to take poisonous trick after trick. There is vast scope for misleading card play—an apparently innocuous play now may be an intentional bad play now to avoid worse play later. When you’re sitting on a hand full of poison, all you can do is sit there and bluff your way out of the hole. Our preferred version of Stichlen is not Sticheln, but double Sticheln, in which each player picks two penalty suits. It took us three games of this before anyone ended a game in positive points. Behind Up and Down the River (never to be dethroned), Sticheln is at the pinnacle of what I love about trick-taking. It’s unspeakably mean, and it rewards smart play. Trying to pick penalty suits is an art of its own: our first few games were punctuated by cries of bewilderment as people tried to decide how to pick a penalty suit (or two). Even now people try different strategies, trying to peel deeper into the opening game of how to pick a suit. And once you’ve seen what suits the other players chose, the real game begins. I play Sticheln at the drop of a hat. It’s superb. Did I mention how much my wife loves this one? I find it fun and painless for a card game. Its very well themed. I think it will keep getting plays for a while longer. I'm pretty sure this is the first time I've ever won this game. If you asked me to just play a trick-taking card game I might not like it. But if you throw in a board and canoe racing, I dig it. Game outcome completely decided by dice? Check! Possible to lose the game without receiving a turn? Check! Skipping your turn is not the worst possible outcome? Check! Still, this game is so cute with the wooden frogs and stringy legs, I had a blast. I think this one probably won't stay in the collection terribly long. Its a fine game, but nothing memorable. There is an effort (like Dominion) to make some randomizers so that each game plays out differently. But the bottom line is that I'm playing a careful placement game like Through the Desert with some luck/chaos factors thrown in. But it plays quickly and its easy to teach. Its just a bit too light to survive for very long in my collection unless it had a more engaging theme or something else unique to lend itself some credibility. As it is, this is just another light thinly themed Euro. Fine for what it is, but I don't really need to own it. This one has gotten a bit of play locally lately. I think this is my 3rd playing in less than a month. This is a game that made a pretty bland impression on me the first time around. But now? It feels like an easy to teach, fairly quick-playing TENSE battle. Turns can be short, and the scoring is straightforward. But in those simple rules and small decisions, a ruthless tug-of-war ensues. I'd love to-reacquire this game some time. I think I'm into the next round on the Yucata tourney. Anyway, I was tied with some folks and then won this last game. I'm still enjoying it, but it starts to feel like a weak player in the game decides it more often than anything clever I do. I love the idea of the original game more than the actual execution of the game. It plays too long for the light team game it should be. Here, its team vs team (which is cool) but the primary mechanism for slowing down your planning is the need to roll the correct symbol on a die (in numerous different settings). We had fun, and the game was much faster. But I had to focus so much on rolling whatever I needed that I couldn't keep touch with what else was going on in the game. While I didn't find that annoying in our one playing, I suspect that would wear thin very quickly. I'm already a skeptic about dice-driven games. This one isn't changing it, but I do look forward to playing again at least another time or two. I won't be buying this one though. I hope I get to play this again soon. I used to own it. For a Knizia, the theme is a lot more effective and lasting. I like train games...and this is one that plays in a reasonable amount of time. The decisions can get tricky, and there are ways to mess with other players' plans (which always makes a game better). I think there is another level of play in this game that I haven't been able to understand yet. That alone makes me want to play more. The statement below is false. The statement above is correct. I got this in an Essen math trade, figuring it could be something I could maybe play with my wife - alongside quite a few other games where I had the same thought. Now, recently I managed to give away a couple of games I don't think I'll play in the next years, and this one survived the purge easily. Not even a thought of giving it away. Why is that? Well, for one, we actually played it, and second, we both really like it, too. Now, a tiny bit of context: My wife doesn't like complex games too much. She plays them occasionally to humor me, but she doesn't really enjoy them. She'd much rather unwind and relax in the evening, and play something that doesn't require full attention. Me, on the other hand, I love complex games, I don't mind if they take hours, and I love it when my actions matter and it's not just blind luck that determines the outcome of a game. And, we both love theme in our games (though we'll occasionally also play abstracts). Onwards to a tiny bit of a gameplay overview. The game is asymmetrical and for two players. One player takes the humans (hunters and woodcutters) that try to make the forest their own, while the other side plays the animals of the forest (foxes and bears) that try to survive and eat (the latter including unsuspecting humans). Additionally, there are neutral pieces (ducks and turkeys), and trees. All of those are represented by tiles that are shuffled pre-game and then placed face-down on the board. This means that neither player knows what is where before the game starts. The players then alternate to either uncover a tile, or move one of their own or a neutral tile. When a tile moves on top of a tile it can beat, the player gets the beaten piece and will receive points for it at game end. And, the different tiles can move differently; hunters can shoot everything except trees as far as they want, but only in one direction - where the gun points. Woodcutters only move one, but are the only ones that can beat trees. Bears also only move one, and can kill all humans. Foxes move as far as they want and can (b)eat ducks and turkeys. And, everything that's beaten gives points. Unlucky or lucky moments happen regularly, but aren't really something to get worked up about because an individual game only takes 15-20 minutes - so after some bad early luck, it's not like you have to live with it for hours and hours, but it'll be over soon and you can get a fresh start with hopefully better luck in the revenge round. 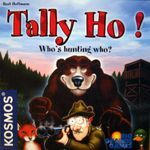 The result is a game that rewards good strategy (when to uncover which tiles, how to use the figures in play) as well as lucky draws (getting a bear just when you need it, having all hunters look into the right or wrong directions), and is the perfect blend of both for a couple exactly like my wife and me are. Because I'd still prefer a meatier game myself, I only give it a BGG rating of 7.5 - right in the middle between "Very good game. I like to play. Probably I'll suggest it and will never turn down a game." and "Good game, usually willing to play." I'm not really sure whether I'm in a position to review this one properly. Arguably, I'm not - I only played the game twice, and the second time is over half a year ago now, too. A result of this is that I'll gloss over some of the more subtle points of the rules, mainly because my understanding of them is not solid enough. I apologize in advance for any rules mistakes I'll make. But, when I was recently asked to review an older game, and I looked for a good game to review, this was one of the games I thought of. It's one of the games that can easily be seen as a precursor to today's deckbuilding subgenre - nobody knows whether StarCraft: The Board Game and subsequently (?) Dominion would have happened without it. What's beyond doubt is that they certainly do share similarities. How is that the case? Each player takes the role of an empire. Essentially, there are the northern empires (with slightly more consistency) and the southern ones (who have more troops that incorporate dice rolls into their results). Each player takes a corresponding combat deck and, with that, gets troops to use. Improving your troops is relatively easy - during your turn, one of the things you can do is get a new card into your deck, from a common deck of upgrade cards that comes with the game and is the same in total every time. Which cards are available when, however, will differ from play to play. Unlike modern deckbuilders, you don't shuffle your deck. Whenever there is a combat, you choose which of your troops you want to use, and in what order. Of course, there is a risk: If you use a troop during a fight, there is a chance that you'll lose it if it wasn't one of your starting troops. There are special rules for attacks at or over sea, limiting how many of what kind of non-ship troops you can use - and special rules for fortified positions at land, where certain troops are stronger and others weaker. One effect of these, after all, relatively simple rules: For less important fights, you probably want to stick with the basics, while for more important fights, you go all in. Another effect: If the other players don't really pay attention, you can build a specialized surprise force (lots of Siege Towers for attacking fortified positions, or lots of ships for attacking over sea - though the latter is much less probable, everybody keeps track of who has how many ships). In each action round, a player can do any one of the following: Attack, Pressure, Expand, Recruit, Build, or Reinforce. A number of action rounds make up each turn (10 to begin with, one less each turn), and there's a scoring round after turns two, three, and four - and after that fixed length, the game is over. Attack: Attack an enemy position, you gain control of the area if you win the battle. Diplomatic Pressure: Weaken enemy control of an area, or overtake the area without a fight if it was neutral. Expand Trade: Area control is independent of trade control for an area - you can expand the influence of your trade into areas you don't own, and will gain VP each round after the first for them. Recruit: Recruit any troop or leader in the public display of available cards, for no additional cost on top of the action. He can recruit as much as he'd like as many times as he wants (with some limits for leaders and aforementioned north/south distinction), but some troops have an upkeep cost that he'll have to pay each scoring round, essentially getting less VPs. Build Fortification: This will make an area easier to defend against attacks. Reinforce Control: This will make an area harder to take over with diplomatic pressure. As you can see, there's plenty of things to do - and always more than you have time for. Fronts will open depending on which starting positions were chosen and who expanded in what direction, who has better forces at sea or at land. Alliances will be forged and bluffs will be called. I haven't really touched other important aspects of the game - leaders that make you more efficient in one direction or another, the resources you'll need for building fortifications, there's more to north and south - but as I said, I'll gloss over those aspects, as I play the game way too irregularly to be any authority on them. What gives you VP in each scoring round is a variety of things: The areas you took military control over (and reinforced diplomatically) according to their strength (which is printed on the map), the trade routes you established in your own and neighboring areas, trade blocks you plundered (yes, you can do that), minus the upkeep for stronger troops (so when you take a strong troop, you better make sure to use it, or it'll actually hurt you). This leads to some different approaches - more or less trade, less higher-payout or more lower-payout territories, more or less military. Not all of them are viable in every game, but then, why should they? This is a multiplayer game, with table politics. Whoever combines table politics and game mechanisms most successfully will take away the win. Long story short, I give this game a BGG rating of 7.5 - right in the middle between "Very good game. I like to play. Probably I'll suggest it and will never turn down a game." and "Good game, usually willing to play." What this means to me is "it's a great game I'll happily play whenever somebody suggests it, but I won't go and seek out a copy, and will rarely bring it up myself when I have free choice." What I really respect in this game is the mechanisms that were very novel back then, and how the game manages to be very confrontational and still very intricate, with lots of decision points for everybody all the time, and little to no downtime because of the short action rounds. All in all, a great game, and judging by how little talk there is about it, a very underrated one. I got a copy of the Bottle Imp for $5 about 20 minutes after telling my wife that trick taking is one of my favorite mechanics. I've gotten a few plays in and I like it so far. It has a very different feel than most trump based games and I think it will be a keeper. The only thing is that it will be hard to play with people who are new. The game seems like it would really reward experience. My wife and I also gave a test play to a 2 player version of Hermit which is for 3 or 4 only and one of my favorite Decktet games. In Hermit you are trying to avoid personality cards which count for points. Its similar to Hearts in that you play until someone reaches a set score and low score wins. In our 2 player version there is added incentive to take tricks throughout the play which creates an interesting tension since you generally wouldn't want to do that in the normal game. We both liked it and it felt pretty strategic. I'm looking forward to trying it again.